As I mentioned in last week’s column, this past Tuesday we testified in front of the North Dakota House Appropriations Committee – Education and Environment Division. 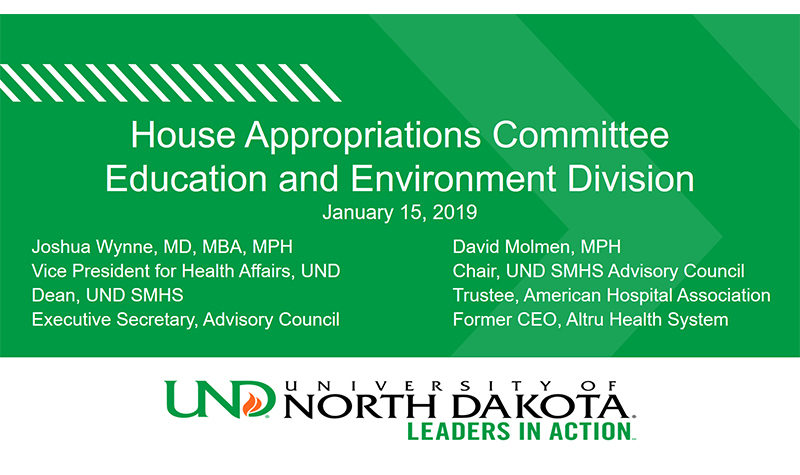 Following morning testimony by the North Dakota University System (NDUS) and then President Kennedy and colleagues from UND, Dave Molmen and I testified in the afternoon on behalf of the UND SMHS. 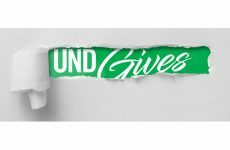 We are extremely grateful to Dave for his efforts and superb testimony; Dave recently retired as CEO of Altru Health System in Grand Forks, but fortunately, for us, continues as the chair of the UND SMHS Advisory Council. Here are the slides from our presentation and the supporting documents that we provided to the committee. The essence of our presentation is contained in slides 45-47 that contain the recommendations of the Advisory Council regarding proposed state funding of the School in the upcoming biennium. The Advisory Council had, in essence, only three principal recommendations: 1) approval of the needs-based budget that was formulated by the SMHS and endorsed by UND, the NDUS, and the State Board of Higher Education (SBHE); 2) approval of the recommendation to move all of the School’s Healthcare Workforce Initiative (HWI) funding into what is called base funding, since some of it has been called “one-time” funding since the initiation of the HWI (even though obviously it is not “one-time” since the HWI spans several biennia); and 3) approval of the four percent per year merit increase funding pool endorsed by the NDUS and SBHE. Our session with the committee seemed to go well, and, as usual, the members asked thoughtful and perceptive questions. All in all, we were quite pleased with the exchange, although we won’t know the final outcome of the deliberative legislative process until the end of April. We anticipate testifying before the Senate equivalent of the House committee sometime in March (the Senate Appropriations Committee). 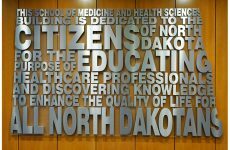 As you undoubtedly know, state dollars are an important component of the funding of higher education in North Dakota, including the SMHS. We derive about a third of our total financial support from state appropriations and a smaller component from a one-mill levy on property taxes. Another 17 percent or so comes from tuition; together, tuition and state funding account for about half of our funding. The other half is about equally divided between research and service grants and contracts, and income from clinically related activities like hospital and practice income and the like. All told, our biennial budget from all sources will approach $250 million this coming biennium! And how do we spend our dollars? The majority goes to the people—faculty, staff, and others (like medical residents)—who make up the School’s workforce. About 70 percent of our funds go to salaries and associated fringe benefits, with the remaining 30 percent going to operations. I’ll go into greater detail regarding the School’s proposed budget at the upcoming Faculty Assembly on Wed., Jan. 30, 2019, at 3 p.m. Further details are available here. 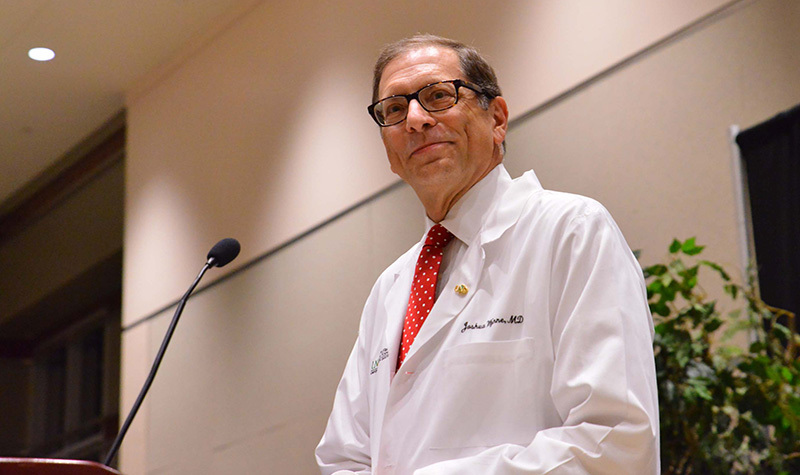 Finally, I am very pleased to indicate that David Schmitz, MD, professor and chair of our Department of Family & Community Medicine, has been selected as this year’s recipient of the Outstanding Faculty Development or Service Award. This award honors a faculty member who draws on his or her professional expertise to serve the university, the profession, and/or the broader community in academic citizenship activities, professional/disciplinary service, and community service. Also, Othman Ghribi, PhD, professor in Biomedical Sciences, is this year’s recipient of the Faculty Excellence in Teaching, Research or Creative Activity and Service. The awards will be presented during the Founders Day banquet on Feb. 28, 2019. Congratulations, Dave and Othman, and well done!